The “Upice” farm is located in Palma Campania, a small hill country in the province of Naples that preserves rural characteristics and peasant traditions. The town is named after a longobard castle whose walls are still present. 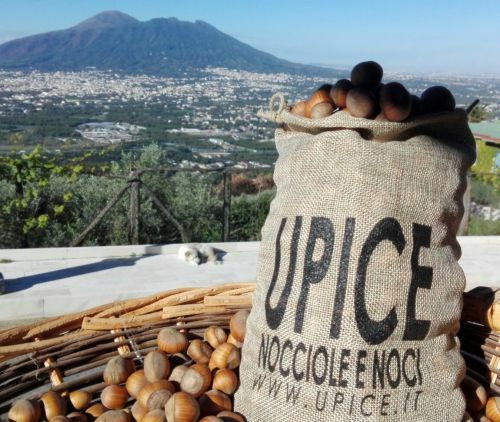 The company “Upice” was born from the creativity of Dr. Gennaro Di Lauri, who combined the ancient farm traditions of the place with modern agricultural systems, managed to produce excellent produce of nuts and hazelnuts (main crops of the site) in strict respect of ‘surrounding environment and guaranteeing the highest quality of the products, from manufacturer to consumer, this is also evident from jute bags used in gift packs which reflect the simplicity and naturalness of the company’s products.